It's not the worst I've ever seen, but it's kind of uneven and doesn't have all that much bite. Leslie Nielson's story was great, but besides that and an alright fourth story, it leaves a lot to be desired. That last story really bugged me though (pun intended). I just figured that King + Romero had to be a winning combo, but in the end, I was hoping for a lot more. Personally, I was not a fan of the first two stories. They both felt rushed & half-finished. However, The Crate & Something to Tide You Over- the third and fourth stories- are really fun and pretty well-done, Crate in particular having lots of moving parts and a solid storyline. Overall, it's a decent anthology, but less than stellar. This excellent direction and acting (for this genre) certainly deserved better screenwriting. Still watchable enough. Nice mix of spooky fun and comedy. Stephen King plays a pretty great hillbilly. While creature effects in full lighting don't hold up today, the film still possesses some remarkably effective tension-building thanks Romero's sharp direction. Really entertaining. Vivid and pulpy 80's horror with light and exuberant thouch. Kind of goofy and bizarre but even when the stories don't make much sense most of them are still decently creepy and/or amusing. Everyone is hamming it up to pleasant effect including the director George Romero and his lighting people. This movie did for cockroaches what cockroaches had previously done for cockroaches. Definitely more of an amusement than any sort of attempt at great horror (and it carries with it the erratic inconsistency that I feel essentially every single anthology film ever made in the history of the medium of film has), but a few of the shorts have a sort of memorable hook to them, whether it's cockroaches gone amok or getting buried up to your head in the surf or uncontrollable terraforming. The crate short overstayed its welcome for me; felt like it was half the entire runtime. 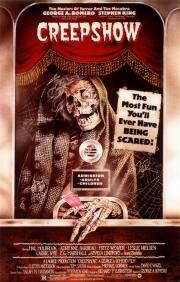 A chain is only as strong as its weakest link, and in much the same way an anthology film is only as strong as its weakest tale, which is why it's such a shame that "Creepshow" is made up of uninspired, brief, and thoroughly unegaging yarns, save for the lengthier segments during the films middle portion. It's not that "Creepshow" is poorly made, or badly directed, or uncommitted to replicating its schlocky comic book style to a tee, it's just that only half of the film is any good. Creepshow was just an elaborate excuse for Romero and King to pay tribute to the E.C comics that influenced them. Like most horror anthologies it's a tad lopsided, but its purposeful style, gallows humour and grotesque sense of justice makes it memorable. The comic book aesthetics are seamlessly integrated, and the garish color schemes are bold and vivid. It's mostly played for laughs, but there is an eerieness to it that's hard to pin down, allowing it to transcend its cartoony origins. The first 2 stories are stylish, but too straightforward; just A-to-B plots. The third is elevated by Nielsen's performance. The fourth is a nice short film and the last a great bit of storytelling. I believe in my heart of hearts that no one will ever be able to come within 100 yards of making an anthology film as funny, malicious, scary, and downright enjoyable.